Sept. 14, 2015, 9:55 a.m.
By Joseph Lichterman @ylichterman Sept. 14, 2015, 9:55 a.m. When the Los Angeles Times announced in June that it was hiring a reporter, Dexter Thomas, to cover Black Twitter, the Internet had many opinions and was not shy about expressing them. The reactions to the new hire were mixed, but the new beat, which covers not only Black Twitter but also other minority communities online, was part of an effort led by S. Mitra Kalita, the Times’ managing editor for editorial strategy, to rethink the types of stories the paper covers. Even as the Times faces significant challenges to (and a little chaos in) its business — last week, parent company Tribune Publishing fired publisher Austin Beutner — the paper is looking to new beats and new platforms for storytelling, from SoundCloud to Snapchat, in order to expand the Times’ audience beyond its traditional readership. After all, climate change and immigration debates in California influence the rest of the United States, too. “I see an opportunity in framing broader stories through the California lens and achieving audience in our state and throughout the world,” Kalita told me. 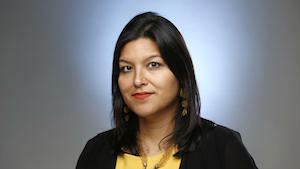 Prior to joining Quartz, Kalita worked at The Wall Street Journal and at the Indian business newspaper Mint, where she was a founding editor. Kalita and I talked about her goals for the Times and how her previous experiences at Quartz, the Journal, and Mint are influencing her current role. Here’s a lightly condensed and edited transcript of our conversation, which occurred before the publisher change. Joseph Lichterman: The memo announcing your hire said you’d “focus on helping us remake how the newsroom works and on creating new forms of journalism.” How do you interpret that and how are you doing it? S. Mitra Kalita:: It’s easiest for me to cite specific examples of stories. In the space of digital journalism, we pay a lot of lip service to the way things should be, and to specific technologies and tools, as opposed to what I think should be guiding us: What is the story? Who are we writing, or shooting, or tweeting, or Snapchatting, or photographing for? Dexter Thomas made a lot of headlines when we hired him because he’s covering Black Twitter as well as other communities of interest online. When it was the fiftieth anniversary of Watts in August, he did something that initially existed on Mixcloud. The L.A. Times doesn’t get a piece of that, but he then came back and transcribed the story. The headline is “The soundtrack to Watts, then and now.” He asked an African American art historian, a jazz musician, and a Watts neighborhood activist: What are the songs that invoke Watts 50 years ago and what are the songs now? He’s okay with readers being a part of his reporting process. During the 10-year anniversary of Hurricane Katrina, I asked if we should do a story on what it would have been like if we’d been on social media during Katrina, or if Black Twitter had existed during Katrina. He put that out to Twitter. If you were areas affected by Katrina or hv friends/fam there, get at me. I want to hear from you. What would you have done with Twitter? Something about it wasn’t sitting well with him. I think every reporter can identify with that moment when an editor asks you to do something and you just don’t think it’s a good idea. He put it out there in a fairly transparent way, and people said that it felt kind of exploitative. There have been a lot of stories on what if the Internet had existed during X or Y. What do we really mean by that? Is this going to be a case where more images, mostly of African Americans, are used to evoke sympathy, or outrage? There was a really thoughtful discussion on Twitter about whether this warranted a story, and he didn’t do the story. He did what reporters have been doing for a long time, which is to do their editor one better. He did a story, “When Kanye West told George Bush that Black Lives Matter.” He isolated that moment that Kanye West accused George Bush of literally not caring about black people. It took a moment and contextualized it with the present. I think that’s an example of how the L.A. Times is changing its news-gathering process. It’s identifying communities of interest that form around content. There’s the reverse as well: Content often forms around communities. How can we tap into that? I hesitate to say it’s entirely driven by social media, because our single largest point of entry remains LATimes.com. Readers come to us to understand what’s happening in Los Angeles, in California, in Washington, D.C., and in the world. So it’s incumbent upon us to alert them to some of these conversations as well. For me, having been in more niche startup spaces for the last 10 years, that’s a real gift. Lichterman: You’re trying to appeal to a larger audience online, beyond readers who would typically look at the L.A. Times. How do you balance those different readerships? Kalita: California is a trend-setting place. It sets the agenda for the rest of the country, certainly in pop culture, but also in conversations around race. In many places, California is already majority-minority, so there’s comfort with a lot of the discussion around the [fact that the rest of the country is heading in that direction]. That’s a real benefit for a paper of record. Take Donald Trump and the comments he’s made about “anchor babies” and the border. If you look at the L.A. Times’ coverage, there’s a lot of explanatory reporting, peeling back the layers using data, as well as using geography. We are in California; there is an Asian birth tourism market here. What can we tell you that “truth-squads” what Trump is saying but sheds light on the community at the same time? How do we write not about those communities, but for those communities? How do we begin to tell stories from the inside out? We want to appeal to those who know the story very well, and also to those who are just entering the story for the first time. Some other outlet might have done it as “The five things you need to know about Jorge Ramos,” but we needed to signal that we know who Jorge Ramos is. Our readers know who Jorge Ramos is. There is a national audience, or a fraction of it, that perhaps doesn’t know who he is. How could we write that story again so that it serves two audiences at the same time? I can think of a number of topics that emanate out of California — race and immigration, health and wellness, technology, environment and coastal management, the drought and the future of water — that are not just national stories, but really pressing global issues. I see an opportunity for us in framing those broader stories through the California lens and achieving audience in our state and throughout the world. Lichterman: How has your experience at Quartz influenced your thinking? Have you been able to take anything you learned there and apply it at the paper? Kalita: Quartz was great for looking at the news of the day and forcing every journalist to say, “What is our way in?” That’s not a new question at the L.A. Times. Every morning, reporters are looking for their way into stories as well as looking to break stories. I don’t know if it’s specific to Quartz, as much as to being at a digital-only outlet and a startup. I would even say this about Mint — it was a newspaper, but it was a no-name product. Every startup starts with an audience of zero, and you have to win over readers. Some of that ethos has been interesting for me to marry with the day-in-and-day-out audience of the L.A. Times. People show up to be informed about what’s happening around them. But because of the way a paper is set up, you are often focused on what the story will be once an event is over. For a digital outlet, there’s an imperative to feel present throughout the life of a story. At the L.A. Times, we’re making strides in being a go-to during events like the Republican debates. Trump’s entry and the issues that he’s forcing are of national interest, but they are of even greater interest to our readers because of race and immigration. The other piece of it is that he’s become a media spectacle. So we need to take issues of media, entertainment, and spectacle head on. What is this reflecting in our society? Live events, like the Republican debates, are an example. We started a live blog called Trail Guide. During the debates, it’s a place that you can hang around. It’s the second-screen experience. That’s a role we can play because we already have a built-in readership turning to the L.A. Times for news, but now they can turn to us during an event, too. And certainly, given the entertainment industry here, you can see how [liveblogging] is a given during TV episodes, award shows, and red-carpet premieres. We’ve started to rethink the way we cover some of those things. The New York Times, The Washington Post, and The Wall Street Journal don’t have the same exact local focus that we do. If you take what we know about digital journalism and apply it to a metro market like ours, what does back-to-school coverage look like? When Los Angeles Public Schools went back on August 18, our reporter was out there at 5:30 in the morning Snapchatting what she saw, and later that became a video that we stitched together using her Snapchat video and then ran on the site. When Taylor Swift was in town, that was another opportunity to Snapchat. Can we remake local reporting as we know it, and in the process bring in new audiences? By doing back to school on Snapchat, some of the kids who are going back to school are going to be our audience. We’re including them, as opposed to writing down to them. Lichterman: Can we expect to see you guys do more on Snapchat or other platforms? Kalita: We need to open ourselves up to the community, and platforms are a great way of doing that and also engaging in conversations, especially during live events. During the Santa Barbara oil spill, a photographer Periscoped what an oil spill looks like and narrated what he was seeing as it was going on. That piece did really well. We’ll continue to experiment with that, but my goal is to bring it back to the site, too. We want LATimes.com to be a destination. Even as we recognize that our readers are discovering us in different ways, my goal is to create a destination that captures the way Los Angeles is living its life. All these platforms, and the types of creative storytelling they allow, make the rest of our products — the website, the newspaper, the events we do — much more vibrant. Lichterman: Any other initiatives we should keep an eye on? Kalita: We’ve been experimenting with translations a lot. At Quartz, I learned that original content might have a better shot, but it’s an area that we’re experimenting with. For the new schools site we launched, several of the articles are translated into Spanish. Three-quarters of Los Angeles Public School students are Latino, so not having a product in the language of those children’s parents felt like a missed opportunity. There’s a lot of integration of digital into the newsroom, but we’re also redefining the story, and asking what is the best way to tell this. Where is the best place to tell this? There may be multiple places and multiple answers, and that’s okay. It’s okay, on a few stories of the day, to really have different strategies going on for different aspects of the paper. Photo of the globe in the lobby of the Los Angeles Times building by Chris Eason used under a Creative Commons license. POSTED Sept. 14, 2015, 9:55 a.m.
Lichterman, Joseph. "California dreaming: How the L.A. Times is introducing new beats and platforms to grow its audience." Nieman Journalism Lab. Nieman Foundation for Journalism at Harvard, 14 Sep. 2015. Web. 18 Apr. 2019. Lichterman, Joseph. "California dreaming: How the L.A. Times is introducing new beats and platforms to grow its audience." Nieman Journalism Lab. Last modified September 14, 2015. Accessed April 18, 2019. https://www.niemanlab.org/2015/09/california-dreaming-how-the-l-a-times-is-introducing-new-beats-and-platforms-to-grow-its-audience/.